Bournemouth Borough Council: Pure Town Planning are pleased to a have resolved a long running planning dispute in Bournemouth by not just winning a planning appeal but securing a full award of costs against Bournemouth Borough Council. The case stemmed from the actions of an aggrieved neighbour together with a local Councillor acting rather energetically on their behalf. 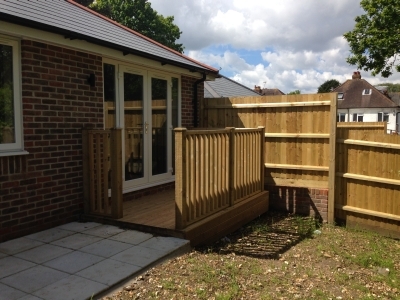 Following their combined representations, a minor amendment application to deal with a few changes to the detailing of the rear gardens, was refused by the members of the planning committee against the technical advice of their planning officers. Struggling for a reason to hang the refusal on it ended up being refused on the grounds of increased surface water run-off causing a nuisance to the neighbour. Not a reason for refusing a planning application I’ve seen before! The Council then even served an Enforcement Notice on our client however when Pure Town Planning told them that it was defective it was hastily withdrawn. We then lodged an appeal against the refusal. After a lengthy appeal the Inspector eventually decided that the proposal would have no significant impact on the living conditions of the neighbours. In making a full award of costs against the Council the Inspector found that the Council had acted unreasonably by failing to explain why the Planning Committee members did not accept technical advice and why they considered that the amended elements of proposal would exacerbate surface water nuisance. If you have had a recent planning decision against which you would like to appeal why not contact Pure Town Planning today?